Many children benefit from using a slant board when writing, both children learning to write and children who struggle with handwriting and posture skills. 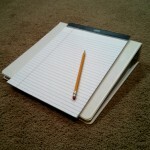 A slant board is an inclined writing surface. Wrist position- the incline puts the wrist in an extension posture (similar to using a vertical surface), which helps to allow the muscles in the hand to develop control for writing skills. Body posture- the inclined surface helps to put visual gaze up from the table top surface, which can improve postural alignment (although if posture is a large concern, I would recommend using a vertical surface first to develop healthy alignment and habits). Read another therapy blog post on the benefits of the slant board. Where to buy? There are lots of variations available online, cheapest I’ve seen are about $30. How to make your own? 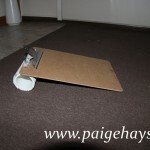 A slant board is not a complex piece of equipment and can easily be made at home. 3 ring binder- find a old 3 thing binder. The width of the binder determines how much slant, so trial different sizes to see what works best. You can just place your paper on top, but younger children will need to tape the paper in place. 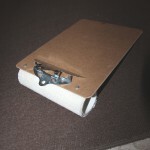 You can also attach a clip board to the binder to hold the paper with hot glue or velcro. C ardboard box- This takes a bit more construction, but costs almost nothing. 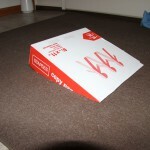 I use the top or bottom of a box that held reams of paper. Cut the edges to form the angle, then tape into place. The top will make a small angle, and the bottom will make a large angle. Clip board, modified- This takes a bit more skills, but anyone handy with a drill can manage this project. I bought cheap particle board clip board. I attached a PVC tube using screws from the top (be careful of the position of the screws so little hands can’t reach in to touch them, or plan to cover them with some silicone to keep kids safe). The size of PVC determines the angle. 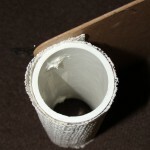 I lined the PVC tube with non-skid matting ($1 at the Dollar Store) to hold it in place. The clipboard holds the paper in place, so no need for tape.